The Youth Wind Pant is available to purchase in youth sizes XS-XL and is available to purchase in your choice of the following colors: Black, Forest Green, Maroon, True Navy, True Red and True Royal. Whether worn alone or with a Sport-Tek® wind shirt, these pants provide lightweight protection. The relaxed styling and elastic drawcord waist ensure a comfortable fit. 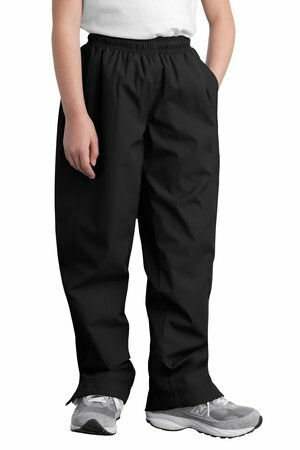 Be the first to review “Sport-Tek Youth Wind Pant Style YPST74” Click here to cancel reply.